We are excited to announce the addition of the Freeze Sleeve to our retail offerings here at Stability! 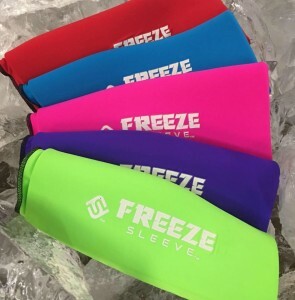 Freeze Sleeves help to ice and compress elbows and knees using a flexible gel sleeve! Who can use Freeze Sleeve? ANYONE! Your sleeve can be used for icing injuries or for those recovery days after a hard workout! It can be used on elbows, forearms, knees, calves, or ankles! Come talk to us at the front desk and get measured to find the best fit for you and your needs!